The English evacuated Paulus Hook November 22, 1783. It is said that during the Revolution there were only fourteen families in Bergen whose sympathies were with the Colonies. Among these were some very devoted patriots whose memory should be cherished. Prominent among them are the names of Mrs. Jane Van Reypen Tuers and her brother Daniel Van Reypen. 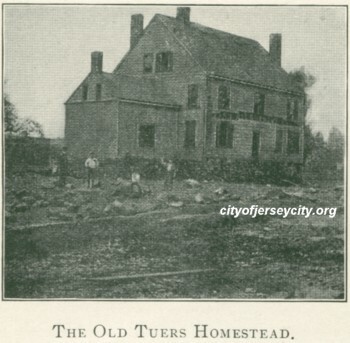 Mrs. Tuers lived at the old Tuers house, the site of which is now occupied by the Armory on the corner of Mercer street and Bergen avenue. During the time the British occupied New York the American prisoners in their hands suffered for food and Mrs. Tuers carried to them sacks of provisions every week. From the weight of the heavy burdens she injured her shoulder and arm so seriously that she was crippled for the remainder of her life. General Bayard, who owned an estate at Hoboken called Castile -- since known as Castle Point -- was at one time friendly to the Americans, but later he became a very pronounced Tory and very vindictive towards all who sympathized with them. At one time Mr. Daniel Van Reypen was arrested and taken before him, when General Bayard greeted him with the question, "Old man, where is your rebel coat?" Mr. Van Reypen responded, "The coat does not make the man, it is the heart." Later, Mr. Van Reypen met General Bayard in New York, near the river, when General Bayard threatened to strike him with his riding whip, to which Mr. Van Reypen coolly replied that if he did, he would throw him off the dock, and the angry General passed on. Another sister of Mr. Van Reypen's had an amusing encounter with a loyalist friend, a Mrs. Outhout, who was constantly assuring her that the rebels would be defeated and that "there would be a devil of a stroke very soon." When Cornwallis surrendered, Mrs. Van Horn quietly reminded her of her prophesies and asked "if this was the stroke?" Catherine Van Winkle and her younger sister Maria were very heroic girls whose names should not be forgotten. They often carried messages from Lafayette to Washington at Belleville; on one occasion they walked there in the night to warn Washington of a plot of the English to surround and capture him. To their quick wit an American soldier owned his life. He was at their father's house, an old stone house a little south of Colonel Spier's burying ground, near where Highland and Idaho avenues now cross, when a party of English soldiers surrounded the house in search of him. The girls hid him between the feather and straw beds of their bed, and then retired, and when the English entered the room to search for him were seemingly sound asleep. The English prodded with their bayonets under the bed and searched every closet and corner but failed to find him. Catherine married a Mr. Sheppard and was a well-known and beloved character on the Hill until comparatively recent times; born in June, 1763, she lived to be one hundred years and six months old, and was bright, cheerful and active to the last. Her remains lie in van unmarked grave in the cemetery opposite the Dutch Reformed Church. Washington appreciated the loyalty of the family and was a guest of their father's, sometimes dining there. One branch of the Van Winkle family still have in their possession a handkerchief left by Washington upon an occasion of his staying over night at the Stuyvesant Tavern.